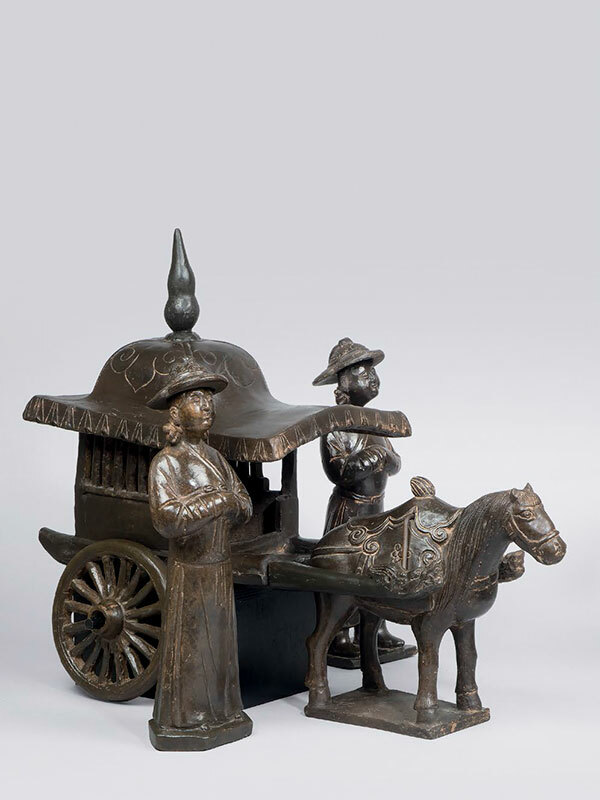 A group of black pottery models composed of a carriage, three horses and four figures. The well-modelled two-wheel carriage has a domed roof and slatted sides. 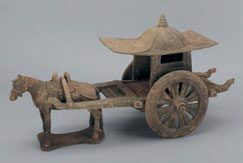 It is fitted with two detachable pulling posts, the ends of which are adorned with dragonheads. A tear drop-shaped finial adorns the domed roof. The carriage is pulled by a small horse, equipped with a ceremonial harness. Two larger horses form part of the group and are fully equipped with saddles and bridles. Each horse is depicted in detail with a bushy mane, bulky body and sturdy legs. The figures are depicted standing and dressed in long robes. The two attendants have their hands folded together inside their sleeves, and raise them in front of their chests. The two grooms each have their right hands half raised. The figures are fitted with detachable hats. The pottery is of even black colour and well polished. 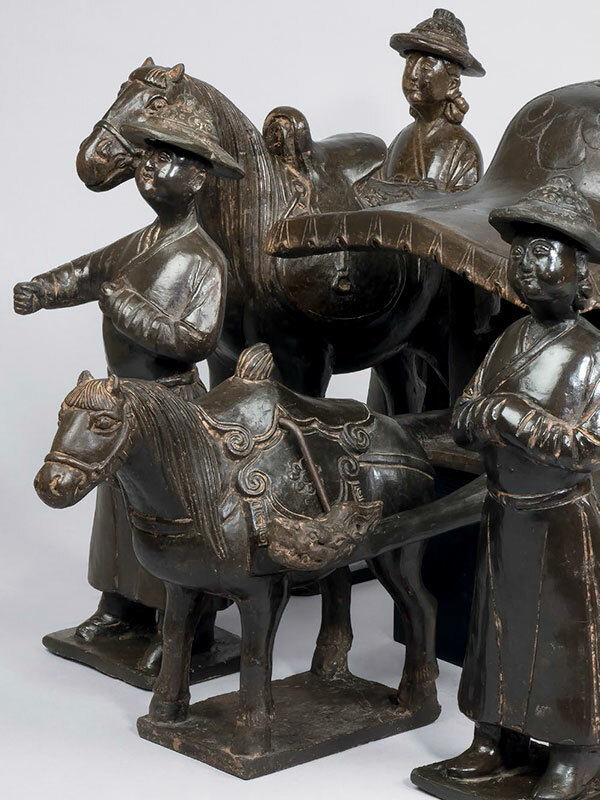 This group of black pottery models is a rare Yuan dynasty example. Groups such as this have seldom been studied by scholars. Only a few examples are excavated in Xian city and the Mongol region. The Mongolian people created the Yuan dynasty and established Dadu (the current Beijing) as their capital. They followed traditional Mongolian burial customs instead of Chinese ways. Figures from this period are quite faithful in their reproduction of actual scenes, whether from daily life or from pleasure pursuits. The present figures, probably including merchants and grooms, wear Mongol costumes with a belted tunic over tight trousers tucked into riding boots; all these to help them against the severe cold weather on the Mongolian Plateau. The horses, different from the Tang dynasty ones which were brought to China from the West, were modelled after one of China’s native horses, the Mongolian steppes pony, from the homeland of the Yuan dynasty. 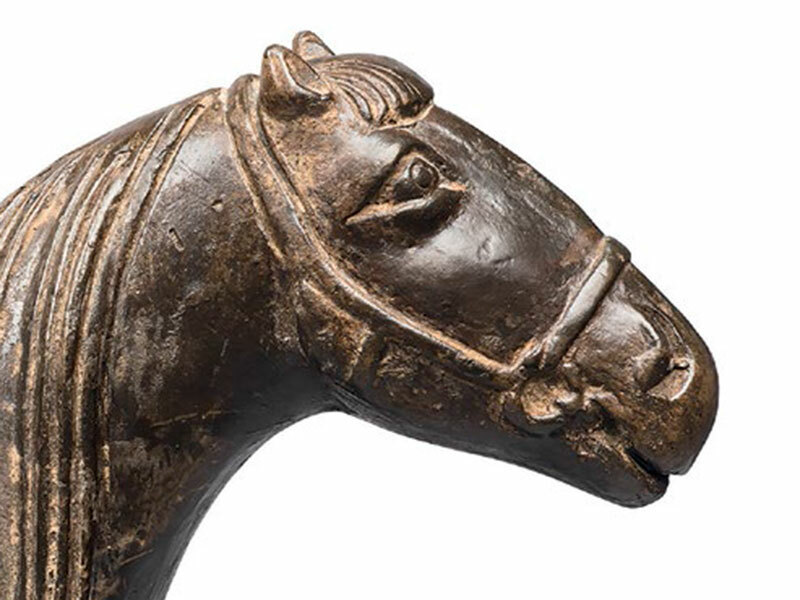 Some closely comparable Yuan dynasty pottery horses and figures were excavated in Xian city and are now in the collection of the National Museum of Shaanxi History. Very similar figures of a groom wearing a broad-brimmed hat and of a servant dated to the Yuan dynasty are amongst a group of figures excavated from the He family tomb in Hu County, Shaanxi province in 1978. 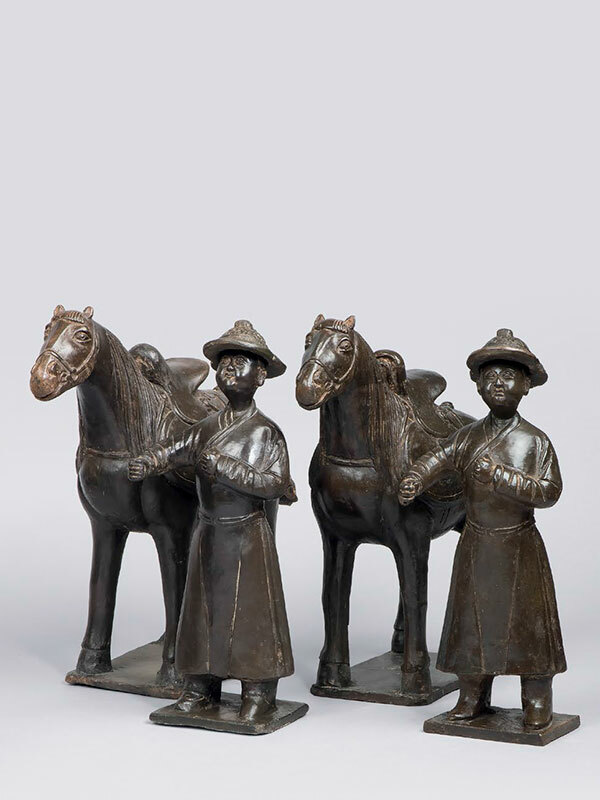 A large group of pottery models, including horses, figures, a carriage and other utensils, is in the collection of the China Agricultural Museum, Beijing (fig. 1). Four comparable pottery horses with grooms are illustrated in Horses for Eternity.